After planning a trip to a remote island for nearly one year the day finally arrived and the newly formed BONE FISH TEAM from PFF departed the Peninsula for some obscure island. All the stories and results of bonefish books swam in our heads as we arrived at the airport to depart for our adventure. The plane ride, some five hours long, began to take its toll upon each of us. So what if there was some movie to entertain us on the flight. The time went by minute by minute. Perhaps it would be better put to say each grueling minute. Then it dawned upon us, it takes nearly five hours to reach destinations in Northern California. Somehow, the trip no longer seemed to grind by. We reached our overnight lodging and gathered together to share our excitement of the upcoming adventure. The advent of a new day found the PFF BONE FISHING TEAM ready to go. We gathered at the hotel cafe and made quick work of the breakfast. The driver for the hotel loaded all our gear and passengers into the van. The driver, we soon learned, had no idea of where we were supposed to be. After making a stop at a competitive airline we got directions to our charter flight. More anxious minutes drag by and we find our pilot and aircraft. Our gear is loaded and so are we. We?re airborne. The flight has no stewardess, no beverage, no meal, but we are on path to a remote island holding the lure of bone fishing. Finally, the pilot informs us that we are arriving. Looking out the window we see lagoons, flats that appear to be endless, multi-colored water and vegetation. We do not see homes, building or other signs of human habitation. Eventually, this small runway comes to view and we set down. We?re all teaming with excitement and anxiety to begin fishing. Not so fast, we have to clear customs. There was no customs agent to be found. Everyone waited, including the pilot. Finally, the customs agent came and collected our papers and fees. A taxi driver appeared and wisked us away to the lodge. The lodge owner greeted us upon our arrival and we settled into the accommodations. Within a few minutes we were in the dining room having lunch. After lunch some of us prepped gear, some of us walked around the area, but most of all we settled in for a week of bonefishing. Early the first morning, following breakfast, everyone loaded on to the bus and traveled to the boats. We had arrived and the excitement could not be contained. As we walked down the ramp to the boats - the captain of each boat paired off with two members of the BONE FISHING TEAM. We were here and had no idea of what to expect. Little did we realize that the first hour and a half would be spent on a bone jarring ride to some remote part of the island. It turned out that because of the tides and winds this was the best area to fish. It was also physically demanding. Hey, we?re PFFers. We?re tough. No one wanted the return ride. How did we do? 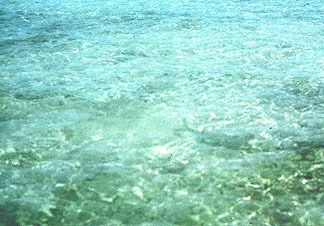 The very first pod of fish that Wayne and I came upon was somewhere over 500 bonefish. It was Wayne?s turn to cast from the boat, boy was I glad he was first. As Wayne stood on the bow of the boat, waiting to cast the captain started telling Wayne where the fish were. The only problem, you cannot cast to all points of compass as quickly as the guide indicated. Imagine, you're on the bow of this 17 foot boat. The guide tells you eleven o?clock, but before you get a second back cast he tells you one o?clock. You check your cast and prepare to cast at one o?clock, but before your back cast lays out he tells you three o?clock. 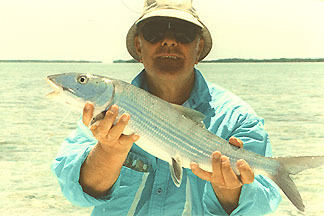 The bonefish were traveling faster than you could adjust. I was glad Wayne got to go first. Not that I would do any better, but I could see what was expected of us. This was my very first day of my very first bonefish trip. We caught fish and then caught some more. 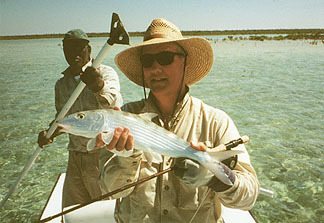 I landed my very first bonefish, about five pounds. It was great. Then Wayne landed a nice eight pound bone. A fish of a lifetime. Wayne was charged. He had no idea that later in the week he would land ten pounder on his six weight. That day Wayne and I traded off, and we each managed to land approximately eight fish apiece. But the return ride back to takeout location proved to be another demanding trip. The evening of the first day's fishing was filled with stories from each Bone Fishing Team Member. The ones that got away, the ones that were landed and ride to the flats were among the conversation at dinner. Having little entertainment most of the members returned to the rooms to prepare for the next days fishing following dinner. In the morning breakfast was served by a delightful staff. Then we would load the bus for the short trip to the boats. This second day we now understood a little more. Some of the members indicated that the long boat ride was not to their liking. Some guide changes took place and off we went. The day passed much like the day before. This day however, the fishing was very tough. Wayne and I lost more fish than we landed. Then we returned via that long boat ride. Only this time we ran out of gas. Its very strange being on a remote island, not seeing anyone else and being out of gas. You can?t push it. Finally, another boat appeared and we made a transfer of some gas. The evening went much like the previous, clean your gear, have dinner and then retire for the evening. The weather turned better on the third day and stayed that way. It made for better sighting which translated into more fish caught. The mornings were fairly standard. Wake up, take care of personal items, have breakfast and get ready for the ride to the boats. Once at the boats pair up with your guide and depart from the flats. Once on the flats your guide would determine the best possibilities for catching fish that day. The days were spent between wading or fishing from the boat. The weather had now changed and the days were providing better fishing and sighting. Approximately 60% of the time we waded the flats. Flats that seemed to go forever. Different members of the BONE FISHING TEAM would report seeing schools of fish up to 1,500. It seems that every flat contained fish. Sometime they were just harder to find. The talk around the table soon developed into what a good time everyone was having. Were we planning a second trip, next year and what the days events produced for them. The time finally arrived, it was time to leave. The bus ride to the airport was filled with excitement from the trip. When would we return next year, or would we return next year? Talk to the members of this first PFF BONE FISH TEAM, and determine if you would like to be part of the second annual trip. Yes, it is planned and a sign-up will soon be made available. There was not enough space to list all the successes of this trip. 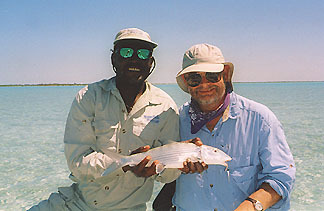 There were seven novice bone fishers when we started and none when we returned.